If you’ve worked with young athletes over the last 15 years, chances are you’ve seen a change in the way they think, talk, or act. In some cases, these changes have been positive—many athletes practice multiple sports, accept diversity on their teams, and are great teammates. But in other cases, young athletes seem to be lacking in focus, passion, and drive, all of which are essential components for success (both on and off the field). 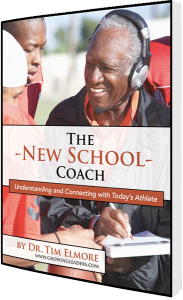 To help coaches tackle this issue, we wrote The “New School” Coach. We believe the changes taking place in the 21st century require us to revise the way we coach today’s athlete. We need a “new school” coach who understands the language of today’s generation. Understand why today’s athletes are so challenging to coach. Have hard (but helpful) conversations with athletes. Discover what today’s athletes need most from a coach. Use a simple communication grid to connect with each athlete. Develop a healthy team culture that allows each athlete to reach his or her potential. Fill out the form to Download your copy of The "New School" Coach.